Calvin Turner Curtis Sr., World War II veteran and recent recipient of a Congressional Gold Medal, passed away on Wednesday, February 27, 2013 in San Antonio at the age of 87 following a short illness. He was born May 17, 1925, in Charlotte, Texas, and was preceded in death by his wife of 55 years, Patricia Lucia Tennyson Green Curtis, and is survived by his three sons, Calvin Curtis Jr., Devon Curtis, and Dr. Todd Curtis. 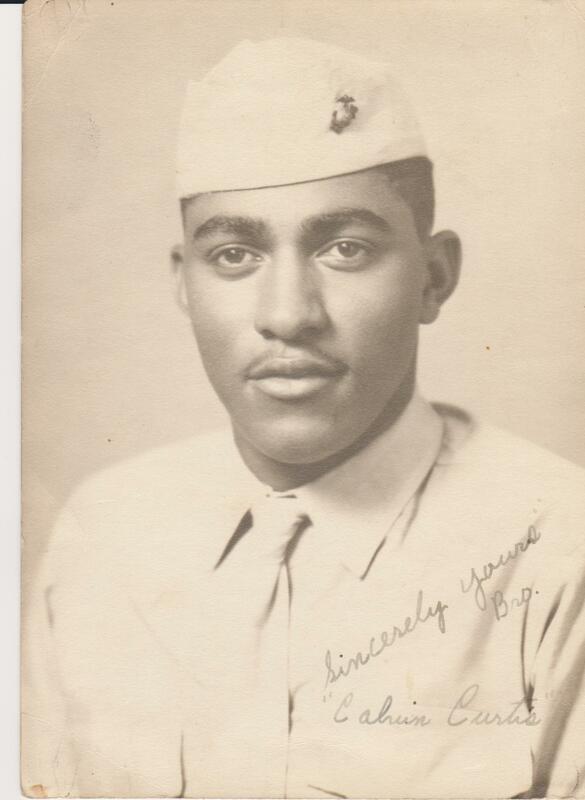 During, World War II, served in the United States Marine Corps in segregated units of African-American Marines. Like the US Army and Navy, the Marines only allowed African-Americans to serve in segregated units, and they all went through their initial training at a segregated camp at Montford Point, North Carolina. The Marines had not allowed African-Americans to serve since the Revolutionary War, and those who trained at Montford Point were known as the Montford Point Marines. Most, like Calvin Curtis, served in ammunition support units during the war. After the war, he settled in San Antonio where for decades he was very active in his community, his church, and a number of organizations, including the American Legion and Veterans of Foreign Wars. In 2012, the US Congress awarded the Congressional Gold Medal, the nation's highest civilian award, to the Montford Point Marines in recognition of "their personal sacrifice and service to their country" as the first African-American Marines to serve in the Marine Corps since the Revolutionary War. Past recipients of the Congressional Gold Medal have included the Tuskegee Airmen; Dr. Martin Luther King and Coretta Scott King; the Navaho Code Talkers, Rosa Parks, Nelson Mandela, and Gen. Colin Powell. Of the almost 20,000 African-Americans who served as Montford Point Marines between 1942 and 1949, fewer than 500 were sill alive and able to receive their medal. Calvin Curtis received his medal in December 2012, less than three months before his death. Visitation: Friday, March 8, 2013, 5 to 8 p.m., Lewis Funeral Home 811 South W.W. White Road, San Antonio. Funeral Service: Saturday, March 9, 2013, 11 a.m., Jacobs Chapel United Methodist Church on 406 S. Polaris, San Antonio, Texas. Burial: Monday, March 11, 2013, 10 a.m. Fort Sam Houston National Cemetery, 1520 Harry Wurzbach, San Antonio, Texas. Funeral services are being arranged by Lewis Funeral Home of San Antonio. In lieu of flowers, donations may be made to the Jacobs Chapel UMC Scholarship Fund, 406 S. Polaris, San Antonio, TX 78203. I am very sorry for your loss. You must be very proud of your father. And I'm sure he was very proud of you. Dr. Curtis, I am very sorry for your loss. Your many fans are keeping your family in our thoughts and prayers! My thoughts go with you at this time. My thoughts go with you at this sad time. My mother in law passed away the same day, she was part of the civil air patrol. I am so sorry for your loss, may you find comfort in this difficult time. Thank you for the videos and commentary. How proud we all are of his service to his country and his community. To see him standing tall and proud while accepting his well-deserved honor still brings tears to my eyes. How grateful we are that he lived to see that day.